Romney aides believe strongly that this race will play out like the 1980 campaign, in which President Jimmy Carter led Ronald Reagan for much of the race until Reagan broke through just before the election. As Jonathan Chait noted, 1980 is a poor comparison with 2012 for many reasons. One is simply that the economy is not as bad in 2012 as it was in 1980. Another is that Obama is much more popular than was Carter, whose job approval numbers were 15 points below Obama’s at this point in the campaign (see Gallup). Consider this: in August 1980, Carter’s approval rating among Democrats was about equal to Obama’s current rating among Americans as a whole. For more on the broader features of 1980 vs. 2012, see Matt Dickinson. But there is another apparent misconception in the Romney campaign, which Nate Silver rightly picked up on in a tweet: Carter didn’t lead Reagan for much of the campaign. Below is a graph of all the polls, plus a smoothed trendline. The public polls were graciously provided by Robert Erikson and Christopher Wlezien, who use similar data from every election from 1952-2008 in their forthcoming book, The Timeline of Presidential Elections—which everyone should buy. I’ve supplemented their data with some late private polls conducted by the two campaigns, which are available in this paper by Warren Mitofsky. 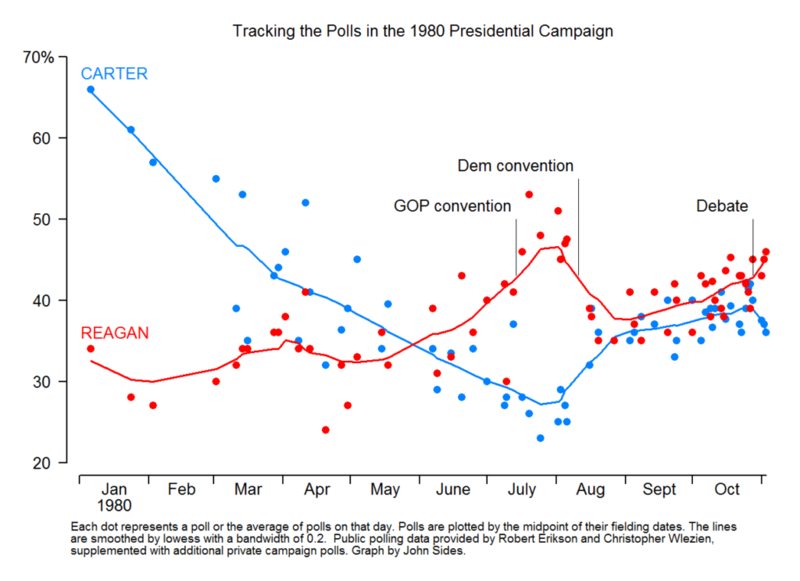 The plot shows what Chait describes, which is the ebbing of Carter’s poll standing throughout 1980. Indeed, Reagan didn’t need his convention bump—which he certainly got—to put him in the lead. The Democratic convention helped erode Reagan’s lead but it never closed it altogether. During that same final week, Richard Allen resigned from the Reagan campaign for an alleged misuse of influence during his Nixon White House days. The same day Carter’s congressional liaison, Frank Moore, resigned after repeating the unsubstantiated story of the Ayatollah’s cancer. On Friday of that week the final economic indicator of the campaign showed inflation still seriously on the rise. And on Sunday morning, November i, the Iranian parliament announced their conditions for freeing the American hostages. Jimmy Carter immediately abandoned campaigning and appeared on national television in the early evening to repeat much of what the public had been hearing all day. It was a week, in effect, with much that could affect the choices made by voters. The most interesting possibility here is not whether 2012 unfolds the way that Romney’s team thinks 1980 did, but whether it unfolds the way 1980 actually did. That is, with a tight race blown open by the Republican convention, giving Romney a lead that Obama can never fully overcome. This scenario is not currently the most likely, as the forecasts suggest, but neither is it implausible. But the numbers don’t really seem to bear out the suggestion that this was a “tight race blown open by the Republican convention”. Rather, the economic and foreign policy double-whammy pretty much dragged Carter down throughout the first seven months of 1980, and the lines actually cross around Memorial Day, well ahead of the GOP convention. There was definitely a convention bounce for Reagan, but it was clear that Carter was in deep trouble well before that. What’s even more interesting is the appearance of a strong _Democratic_ bounce as a result of their convention. Today, the Dems’ 1980 convention is regarded by conventional wisdom as a failure, mostly remembered for the image of Carter chasing Ted Kennedy around the stage trying to coax him into a “unity” photo. But unless there was some contemporaneous event that I don’t recall, it looks as though the convention actually succeeded in getting Carter back into the game. I suppose the real lesson here is that no two elections are truly analogous. For Romney to win, he’ll need a touch of 1980, a dash of 2000, and maybe a little 1992 (albeit without Perot). Or, you know, he could blaze his own unique path. Anyway, I hope our pundit class–which is hopelessly in love with this sort of analysis-by-analogy–reads this excellent post. David: You’re right re: the “tight race blown open line.” That’s a sloppy reading of the graph. Reagan was well ahead by the convention. And that’s an interesting point about the conventional wisdom re: the Dem convention. I hadn’t heard that. But it wouldn’t be the first time the CW is wrong! Thanks for your comment. Today, the Dems’ 1980 convention is regarded by conventional wisdom as a failure, mostly remembered for the image of Carter chasing Ted Kennedy around the stage trying to coax him into a “unity” photo. The 1980 Dem convention is also remembered for one of the great pieces of political oratory at a convention in recent decades, namely Ted Kennedy’s speech (written mainly by Robert Shrum, but Kennedy had to make it successful in delivery, and he did). I especially remember the lines in which Kennedy attacked Reagan for having the temerity to wrap himself in the mantle of FDR. And the closing, in which Kennedy quoted Tennyson, iirc (“I am a part of all that I have met/Though much is taken, much abides….”) But don’t rely on my fallible memory; those interested should go read the text, which I assume is available online. Interesting data that would have a majority of folks laughing at the line, “…the economy is not as bad in 2012 as it was in 1980”. That’s not what Obamas own campaign would tell you. They would argue it’s as bad as it’s been since FDR took office and then they would point fingers in 100 different directions. My friend, this economy is downright atrocious. Today in N California, gas is $4.09 a gallon for regular. Unemployment is only going down because folks no longer qualify for unemployment benefits so they are not tracked. They quit looking for work. This is as bad as most people have ever seen. You’ll need to draw a new chart when Obama is voted out. Gas is 4.09 in a high price market? Oh dear, it must be the President’s fault that… worldwide demand for gas climbs higher every year! So despite the fact that US production is at a 10 year high, the price is going up. Simple supply and demand, and even with that the inflation adjusted price isn’t bad. The unemployment rate is not calculated from the eligibility for benefits. Its going down because we’ve added over 4 million private sector jobs in the last 4 years. It would be a lot better had we not cut those million public sector jobs. Thanks for playing. Unemployment stats are NOT gleaned from unemployment benefits. They are determined by monthly interviews ….Current Population Survey, nothing to do with filings for benefits. You guys fail to acknowledge the facts that GDP was up and the economy had numerous signs of stabilization and leveling off, in other words the storm had been weathered in March 2009, (two months after the Messiah took office) and if is wasnt for excessive govt. spending AKA = stimulus, printing more money, crony capitalism and other Obama policies, this Administration of “rookies” drove the economy further into the ditch rather than out. Now we have his foreign policy unraveling right before our eyes, our US ambassador and other Americans murdered and more unrest. I suppose this is Bush’s fault? Enough is enough with this clown in office. “The stock market,corporate profits,private sector job growth:all have been strong.”With that statement,you have sealed your own fate.You have NO credibility and are wasting your and everyone elses time.Goodbye. Historical Data: Political campaign historians will recall President Jimmy Carter led Ronald Reagan by a near double digit margin late in the fall in 1980. In that race, the voters made their decision based on the key issues confronting the nation and it determined the outcome. I suspect the Romney campaign only cites the Gallup polls, which did suggest Carter was pulling away in October 1980. Where is the nearly double digit lead there? This graph is right of of Pravda. I was there. What has been seen, can’t be unseen. Of course, you’d have to be well over 50 to know that. If you’re not over fifty – you’d better get a second source. There is one problem with this analysis….. Reagan won by 10 points…… So Romney wins by 5 instead of 10. You are kidding yourselves if you think 1980 is not similiar to 2012. Yup, keep unskewering those polls. Reagan also had a 16 year record of activism that won him considerable love within the conservative moment, a new argument (which today’s Republicans continue to use 32 years later), a winning personality, excellent speaking skills and the hostage situation. Romney has none of these. Plus 47% and he neutralized his Libya argument by speaking before he had the facts. All in all, that is worth more than five points. Let’s face it: you’re all scared shirtless that the current polls could be wrong, that the similarities between Obama and Carter are not superficial and that there could be a milder but devastating repeat of the 1980 election. Because of that fear you whistle in the dark with hopeful articles like this one. The difference in the major polls in 1980 which showed a close race between Carter and Reagan and the actual election result of a Reagan landslide is the real issue. The fact of this is well known and is even mentioned in the Mitofsky pdf cited. Republicans are right in decrying not only the current polling methodologies but also the media emphasis on the skewed data which supports Obama. In 1980 it was the paper of record, the New York Times who in discussing the race in Texas had this to say: “a New York Times/CBS News Poll, the second of seven in crucial big states, showing the Reagan-Carter race now a virtual dead heat despite a string of earlier polls on both sides that had shown the state leaning toward Mr. Reagan.” Reagan won Texas by 13 points. In Illinois the Times said this: :…uncertainty about Ronald Reagan’s leadership, especially among suburban voters, [has] apparently set back Mr. Reagan’s hope for a victory in Illinois and left his campaign scrambling to regain lost momentum, according to advisers in both camps. ” Reagan won Illinois 49.65% to 41.72%. It is unlikely a landslide in either direction will occur this time around, to think that way would be wishful thinking on the part of Republicans. But what Democrats should fear is what they have helped to create, a media which is so intent on reelecting Obama that they ignore any other possibility. If there is a Romney win then a lot of Democrats are going to be seriously disillusioned and completely blindsided. Turns out pollsters aren’t as dumb as the GOP pundits would wish them to be. In other news, water is wet, the sky is blue and fire is hot. I remember the 1980 election. I voted in it. Some pols had Jimmy Carter leading Reagan to very near the end. I have seen the same phenomanon in other elections. I have seen pollsters declare on nation wide TV that the people lied to them. It all comes down to this. Pollsters lie. They lie to effect the flow of money to campaigns they don’t like. They lie to convince donors that they are throwing their money away. They lie. Now you are lying about past lies. Good luck. Nobody believes you unless your lies correspond to what they want to believe. 42% think you are lying (Romney supporters) and 40% think you are telling the truth (Obama supporters). Apparently 18% are too polite to call you liars. Your lies will change nothing . I only hope you keep lying to the end so I can see the bookies who believe you go broke and see your credibility finally evaporate forever. I came across this piece after searching for info on the 1980 elections. Very informative. It’s nice to see people disagree and still be civil and logical in their arguments using facts and not relying on the propaganda that is being thrown out by both sides and the media. Whoever wins, I hope will bring a spirit of cooperation to Washington. Right now, that looks like Romney has an edge in that department. The current administration is actually resorting to childish name calling and juvenile tactics. Their arrogance isn’t helping to sway undecided voters either. Anyway… That’s my two cents. I distinctly remember in 1980 hearing over and over that the race it “too close to call”. I even remember my history teacher discussing after election day how wrong the polls were and that they were going to have to take a hard look at future polling. The polls noted above could very well be accurate, but the media failed to report all of the other polls and must have referred only to Gallup. I think it’s fair to say most people expected a very close election and were surprised by the outcome. Polling may be much more accurate now than in 1980, but the trend in nearly all the polls are Romney has momentum. Election night will be interesting. Nope it wasn’t. By early evening everyone knew what was coming. The winner was never in doubt, the only question was the margin of victory (electorally and popular vote wise). Heck, even John McCain managed to get more popular votes than the GOP candidate from 2012. Why don’t you post a similar timeline plot graph of Obama vs Romney. This is the comparison that we want to see. Without the graph, you are not backing up your statement. One factor you have forgotten is the John Anderson candidacy. Someone on here said that a person would have to be well over fifty years old to remember 1980. Well, I’m not. I was twenty and unemployed when Carter was president, as I am now. recall everyone in my family being scared to death that Reagan was going to start a nuclear war. Just as everyone is afraid that Romney will somehow aggravate the class war that the current president has elevated above all else. But then, in my area, Carter led by four points the Friday before the election. All of us in the family went to bed thinking that Carter would win, even though the returns were showing an increasing lead for Reagan. The next day, after seeing the morning newspaper, we sat around talking about our votes. My dad, brother and me, we voted for Reagan. My dad, cause he didn’t like a weak America, my brother and me, cause we lost our jobs a year before. My mom voted for Carter cause she thought Reagan would send her sons to war. Wow John, so you’ve discovered the fountain of youth. You were “20 and unemployed in  just as you are now.” Please tell us how you have remained 20 years old for the past 32+ years. An interesting note about the 1980 election is that the voter turnout was just barely above 50%. This would indicate that a lot of Dems just did not vote. Voter turnout could be a factor in this election in one of two ways: A very modest turnout will probably swing toward Romney; a very high turnout of Independents will probably swing toward Romney. By Wednesday morning, we should know. The days of comparing President Obama to Jimmy Carter are over finally. Obama got reelected. Since Obama got reelected Republicans won’t be able to call Obama another Jimmy Carter anymore. Mitch McConnell has issued a statement that it is his express purpose to ensure that Barack Obama remains a two-term President.